Drilled and Deburred Holes, Now for Edges. Happy Memorial Day!!! Thanks to all those that have and are serving for our freedoms! I was able to get to the shop after a family BBQ. It was time to start some rib prep. I began by taking my angle grinder with a 1″ Scotch Brite wheel and deburred all the interior lightening holes. It went pretty fast. I then opened up the tooling holes in the forward portion each of the aft ribs for accessories. 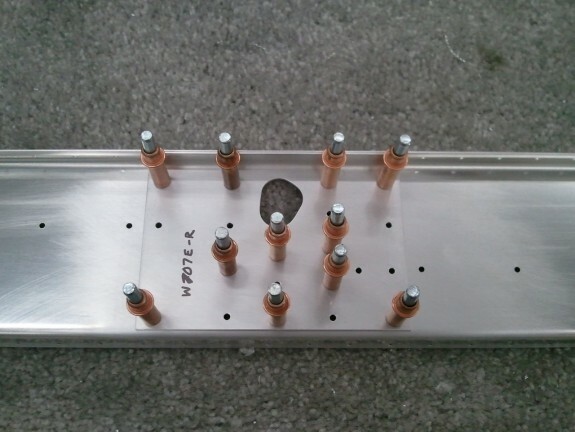 In the left wing, I opened both the upper and lower holes to 3/8″ and in the right, just the lower tooling holes. 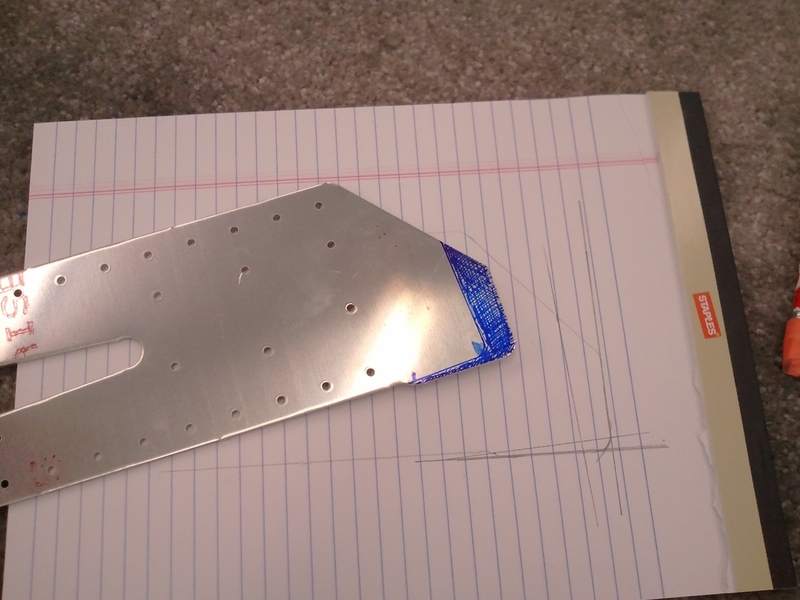 I continued and made a paper template to drill the 3/4″ holes in the ribs for a conduit that will run root to tip. I marked all the ribs and used the step bit on the drill press and knocked out all the holes. I backed the rib with a chunk of 2X4 and each came out nice and clean. Next up, I deburred the new holes and the tooling holes I had opened up. That is when I had a “head slap” moment and realized I had made a stupid mistake. Can you spot it? Times up! 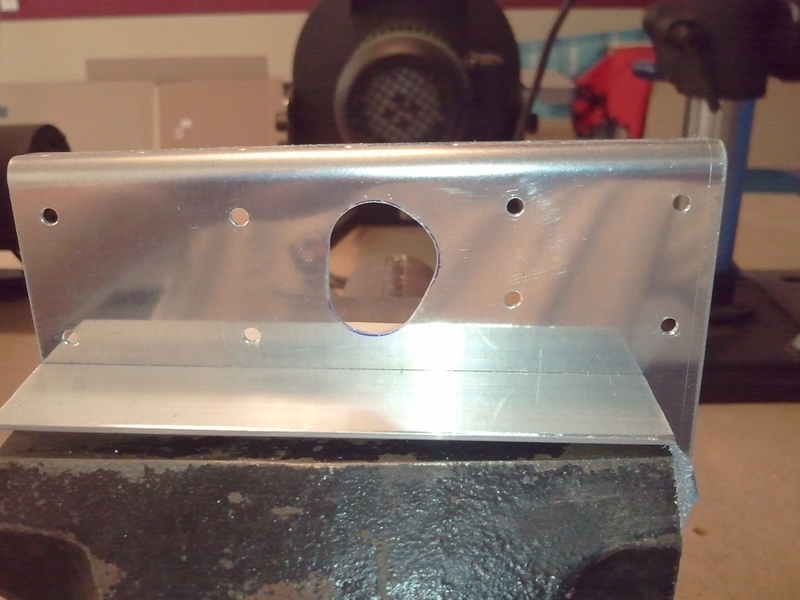 I drilled the 3/4″ holes aft of the stiffening bulge instead of forward…doh! I sent off an email to Van’s and admitted my folly and asked if I now needed to buy all new ribs. They replied with assurance that my location would pose no problems and to build on. Whew! Structurally my hole would have no impact any greater than where it should have gone. 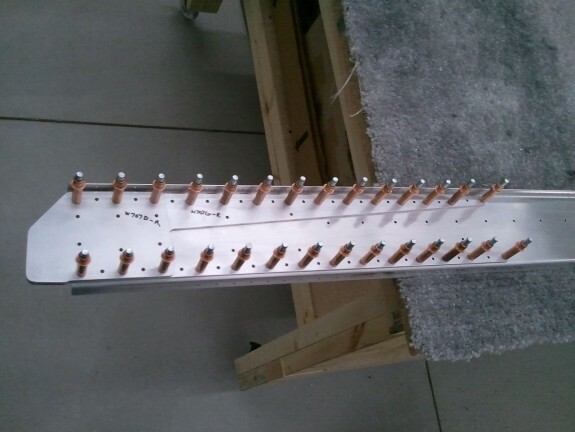 The biggest concern is if it will interfere with the push rods for the ailerons. They actually give better clearance to the main push rod and no difference in clearance to the aileron push rod than had I put them forward of the stiffening bulge as recommended by Van’s. Here is the projected plan for all the holes in the ribs. 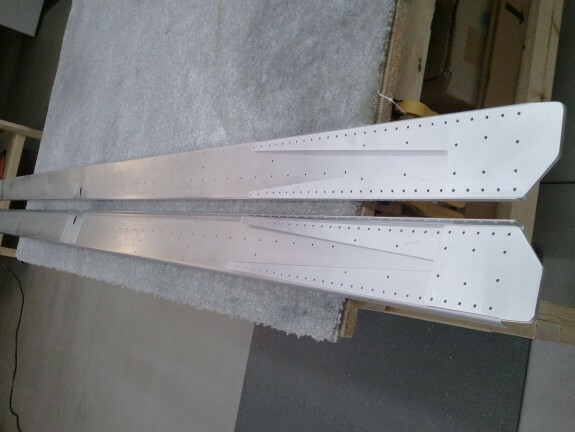 Pitot (5052-0 1/4″ OD 0.035″ wall aluminum tube) hard line to the root of the wing. SafeAir1 pitot line from there to instruments/AHRS. Open for future need for Com/Nav/Marker antenna in wing tip or other accessory. Hopefully that is enough and insures that no noise is introduced into any of the systems. 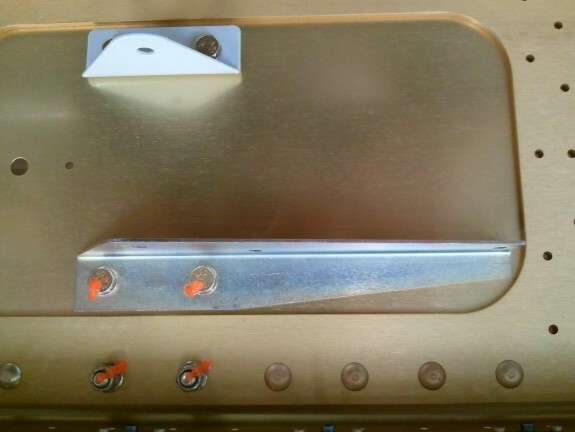 High wattage lights were/are traditionally where most noise is introduced, so by separating them from any potential com/nav antenna wires should help eliminate this problem. That and the LED lighting being so low in wattage, I should be OK. Nothing to see here. I sorted the ribs per the plans to segregate them into stacks for each wing. The work to get to using these is extensive and daunting. Deburr lightening holes, flanges, corners, accessory holes. I hear the first 3 steps take hours each. Oh the fun to come. Not too many pictures, I spent the day doing “Honey Do’s” and then got to smashing rivets. I was able to get all the rivets that can go in now done. 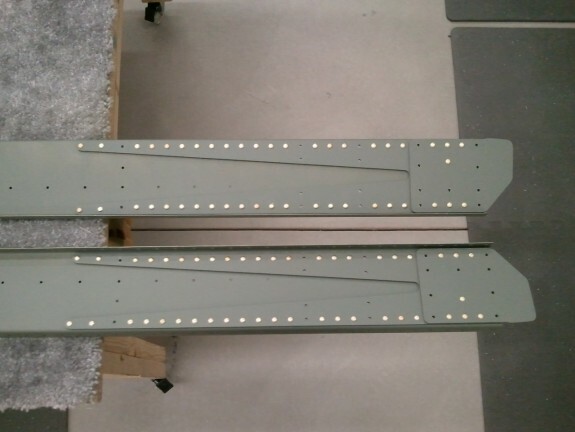 The open holes that remain are for ribs or other brackets that will come later. I love it when you can smash parts with rivets. Means you can move on to something else. I was able to prime all the rear spar parts tonight and clean up the shop for riveting tomorrow. No pictures. Tonight I continued the rear spar work by match drilling the doublers. I read on several builder sites about the furthest outboard holes on these doublers and the need to countersink them for flush rivets. The reason flush rivets are needed here is because an aileron bracket goes over the top. I felt the doubler was too thin to safely countersink. Other builders felt the same. I prefer the stronger joint that is made by dimpling the holes. This is an acceptable modification per Van’s as well. I simply have to remember to dimple the end rib holes as well. 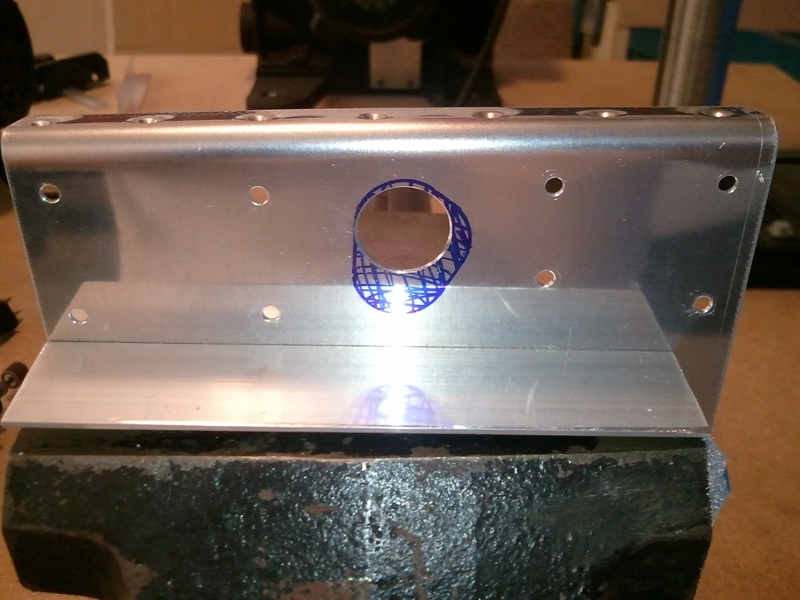 This will leave all the material thickness behind the aileron bracket that will be attached later. It may be overkill, but it is my plane. 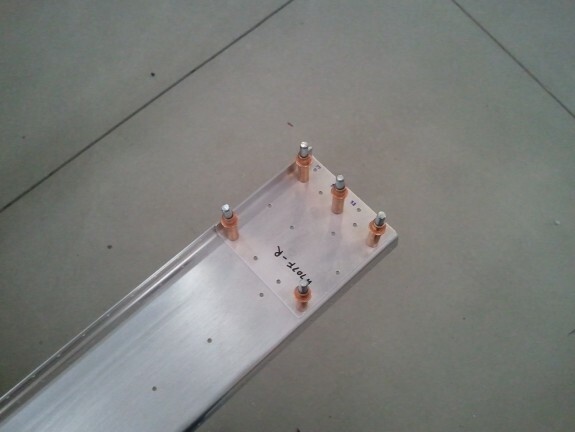 Another thing that has to be done is matching the aileron push rod exit in the center spar doubler. I clamped the doubler tight against the spar, match drilled and clecoed it on, then traced the hole dimensions onto the doubler. I then removed the doubler and used my step drill bit to remove a majority of the hole material. Then I clamped the doubler into my bench vise and filed the hole just shy of the trace line. Once close, I clecoed the doubler back onto the spar and finished the hole with my Dremel and sanding drum until they were an exact match. Once the holes were matched, I then put a Scotch Bright wheel in the Dremel and polished the holes together. They turned out great and took about 15 minutes for this spar. Next up was match drilling the doubler fork on the inboard end. Nothing special here, just hit every hole with a bit. It was late so I called it a night. A few things showed up in the mail today. One of them was the the TruTrak autopilot servo brackets I was able to get from SteinAir. As I understand it, they typically do not sell the brackets sans the servo, but they accommodated me. I had a few minutes so I installed and torque sealed the bolts through the bracket onto the right spar. 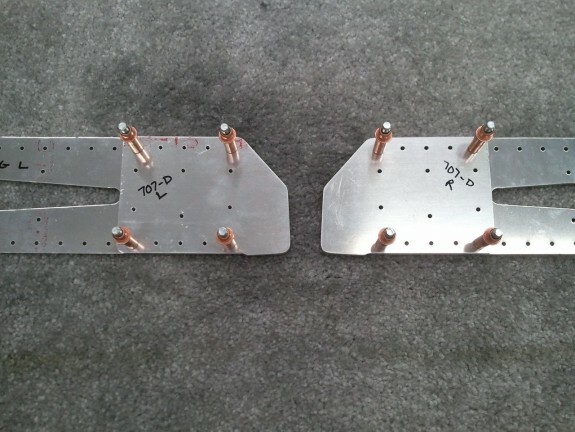 Now when I do buy the autopilot once I settle on the EFIS/AP combo, I simply need to bolt it in to the ready bracket. I spent some time cleaning up the bench and shop to start work on the rear spars with less clutter. Since I tapped the tie down blocks, I figured I should test them with some tie down rings. Van’s does not supply them in the kit. I think because they are an easy to source local item for standard forged 3/8″ eye-bolts. I went to my local Fastenal and looked at them. They seemed very ugly to me. You spend all this time building a nice looking plane to have nasty looking eye bolts hanging off the wings? 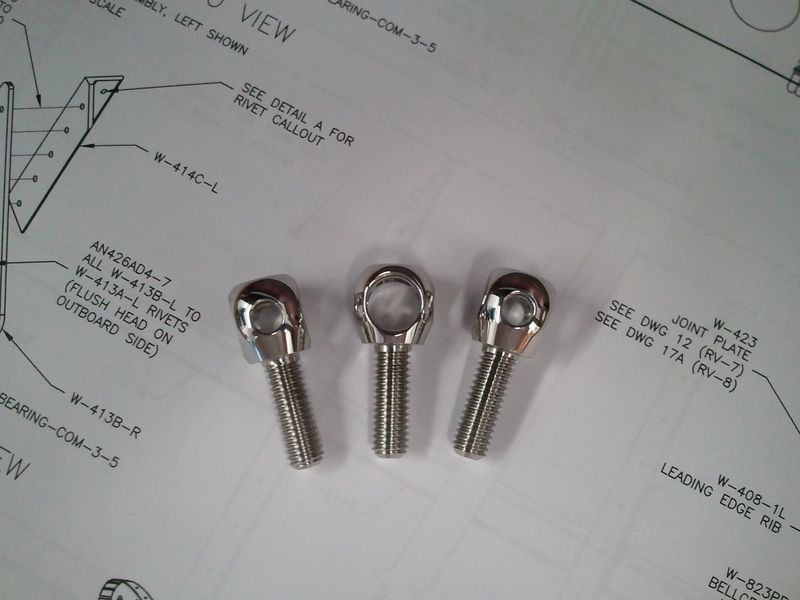 I remembered once that Cleaveland Tool sold some VERY nice looking stainless steel machined tie downs. 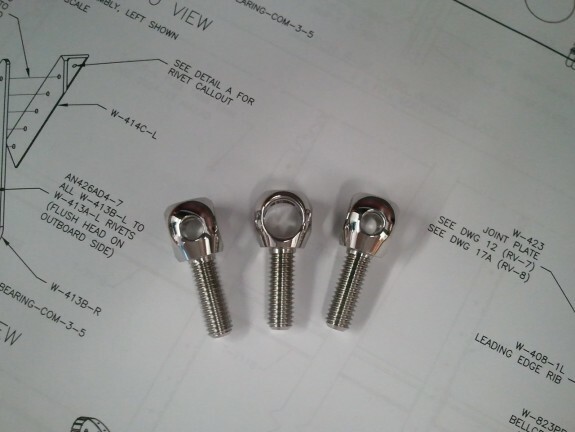 While not as cheap as standard eye bolts, they are much better looking. I needed to order some other tools anyway, so I tossed three of these in my order. I figure if I go tail wheel, I can have a spare. If I go nose wheel, I have enough. They arrived today and they are a thing of beauty. The machining is amazing. The finish however was simply satin. I have polished metal before and figured, I can get these to look REALLY good. My wife had church work to do, so I had all the kids come out and enjoy the weather while I tossed my buffing wheels into the drill press and started to polish them. The finish was so nice that it really only took a little buffing to bring out the shine. Near the bolt part, the machining left small lines in the surface that I hit with some 600 grit wet/dry sandpaper. Once sanded, I simply buffed again. Now that they are polished to a mirror shine, they look like they belong on a nice plane. It may seem overkill, but little details can make the difference. It was the only thing I had time for anyway. I got out to the shop for a little bit after work and started the rear spars. 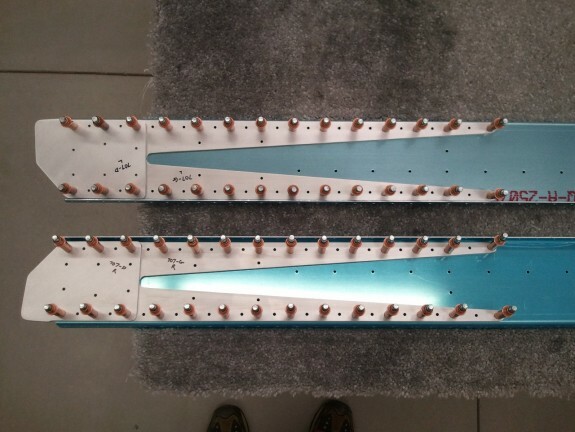 First task is to trim the doubler forks and doubler plates that attach to the fuselage and spar. This apparently is only required for the RV-7 and RV-7a’s. The 7 and 8 share the same wing with a few tweaks. 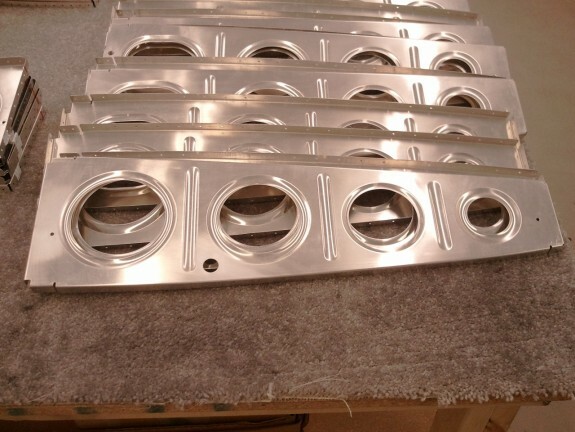 These are 0.040″ parts, so cutting them is not easy. My band-saw did make it easier and I was able to trim close to the line, run over to the 12″ disk sander and sand them closer, and then finally hit it with the scotchbright wheel. The layout was not so easy as the plans use extended lines drawn from the part itself. I simply traced the part onto some paper, superimposed the same lines from the plans onto the paper and then transferred the marks back to the part and then cut. I then used the first cut one as a template for the rest. As a side note, Van’s does appear to have a full scale drawing in the plans of this trim, but it is not sent until the fuselage kit. Seems a little silly. Van’s should move that drawing to some empty space on one of the plan sheets for the wings. Thank goodness for preview plans however. 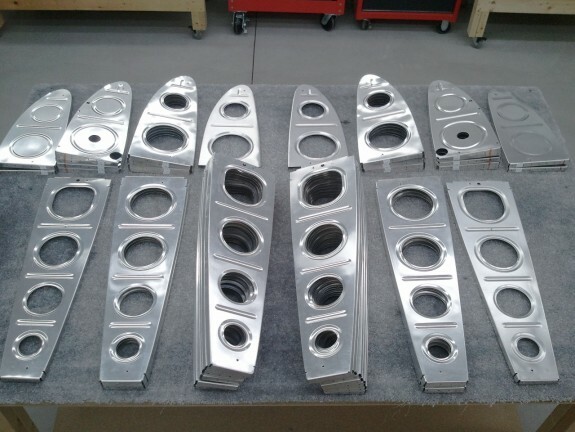 Here are the parts after trimming and deburring them. It was then time to debur all the remaining edges. For this, I pulled out a file and the bench vice. I then hit them with the scotchbright wheel on my grinder and then completely buffed them with a maroon scotchbright pad. They have to be primed anyway, might as well get them ready for it now. Once buffed, I clecoed them in place on the inboard side of the rear spars. They are ready for match drilling. At this point, it was time to call it a night.